Tea is an emotion, not only a popular drink. So, there is always a tea time somewhere in the world… Teatime means a cup of tea, teapot with some delicious snacks, and a romantic novel to read. Well, well, this really makes sense to fancy a cup of tea for all those tea lovers out there. 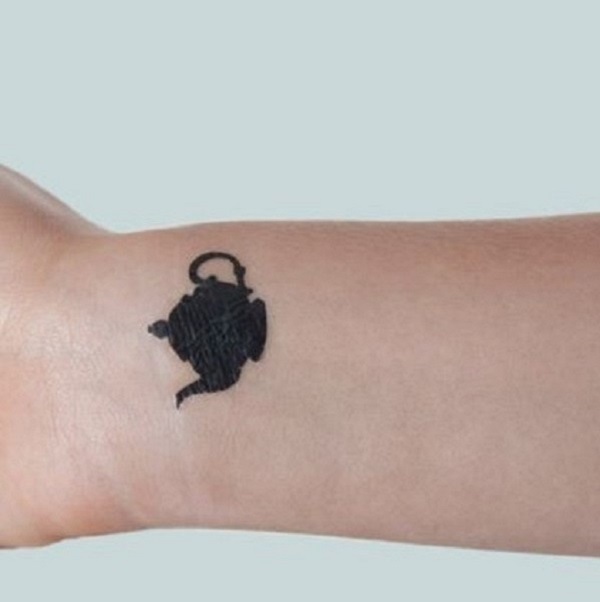 But wait, what about teapot tattoos? Teapot is always associated with the tea time and tea nerds and they dates hundreds of years back. The first teapot with the present shape was produced in Imperial China, especially in the Yuan Dynasty. Sometimes, seen as a luxury item, teapot can be the pure source of happiness and joy for those who are in pure love with tea. The teapot or tea tattoos are usually a tribute to this popular drink, that is celebrated not only in a single part of the world, but all across the globe. And as mentioned earlier, tea is not a drink, but is an emotion, with which tons of people are connected. Moreover, some people embellish their bodies with the teapot tattoos as to honor their parents or grandparents, who cherish(ed) tea. The teapot tattoos can be added simply or singly, but it can also be combined with the banners of quotes, a cup of tea, book or different elements, to decorate the design and to give it some other meaning. If you are one of those tea lovers, and want to take your love to the next level, nothing could be better than having a beautiful and elegant teapot that looks good and sit on every body well. 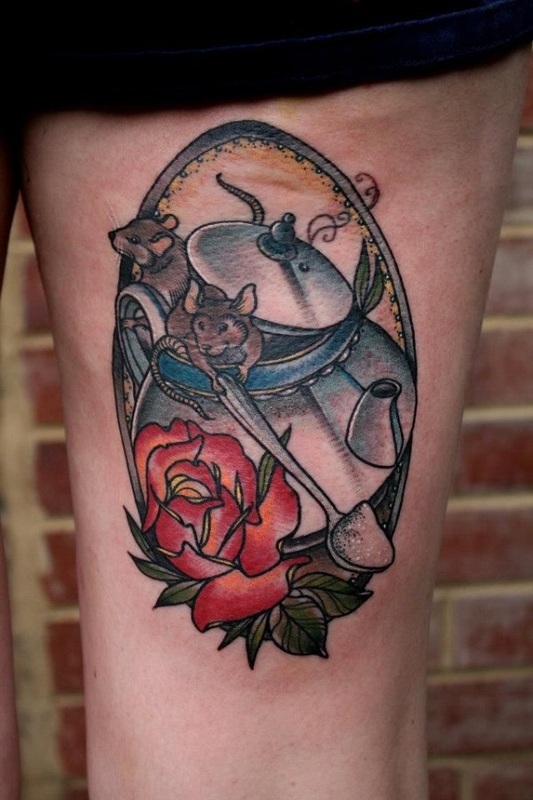 So, take a look at some amazing Teapot Tattoo designs, that you can have as your next tattoo. The Floral Teapot Tattoo Piece. This one might be your teapot, if you really owe the traditional teapot set. 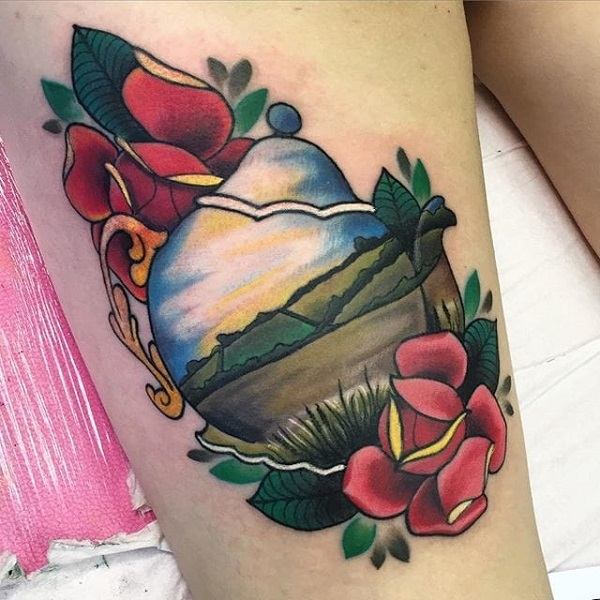 A teapot Tattoo with detailed scenery. Nothing could be better. than coupling teatime with nature and lonliness. Colorful Teapot Tattoo Design. If you are a true lover of tea, you would definitely find this teapot tattoo design really soothing. Magical Teapot Design. This amazing play of water colors is magical and makes magical teapot tattoo design. Teapot with Flowers Tattoo Design. If you are looking to give tea a tribute with something elegant and simple, then nothing is better than this tattoo design. This Elegant Piece. 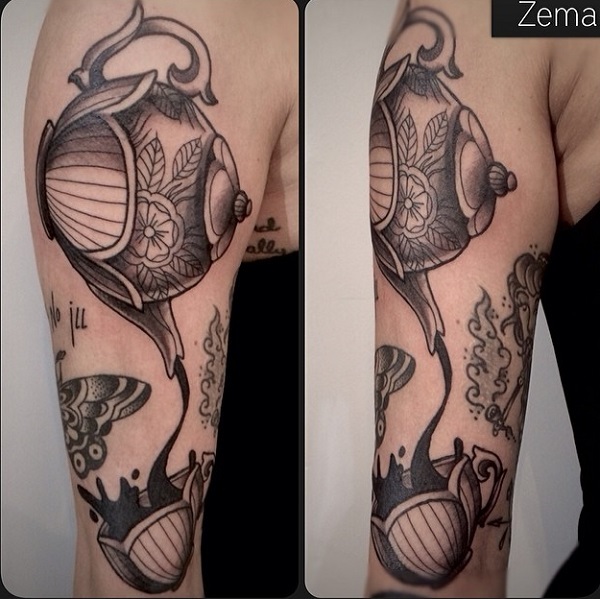 This jaw dropping elegant piece of teapot is yet another trying worthy tea tattoo. Thigh with Teapot. 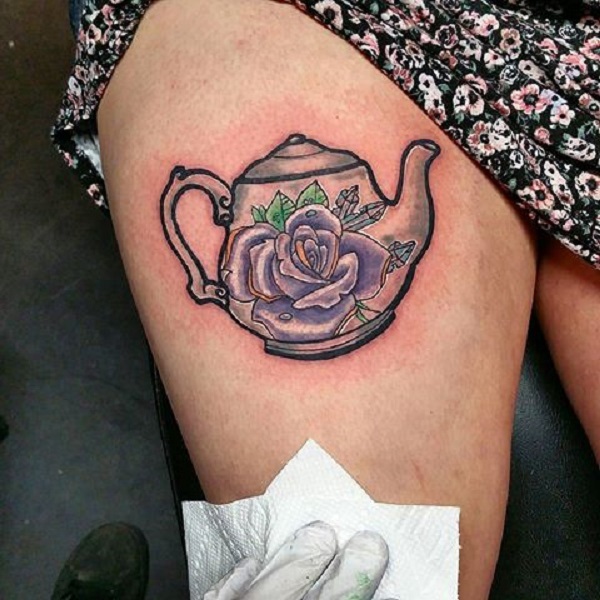 Looking for a teapot thigh piece? You would definitely love our next teapot tattoo design for thigh. Tea of Love. You might have seen this lovely teapot in some fairy tale movie. 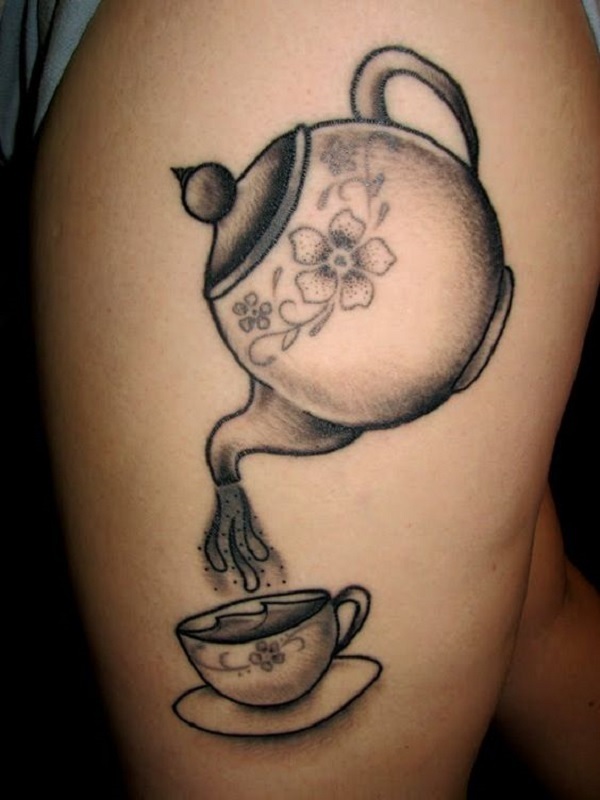 If not, you can have a look at this lovely teapot tattoo. Smoky Teapot Tattoo Design. Tea only smells great when its hot. 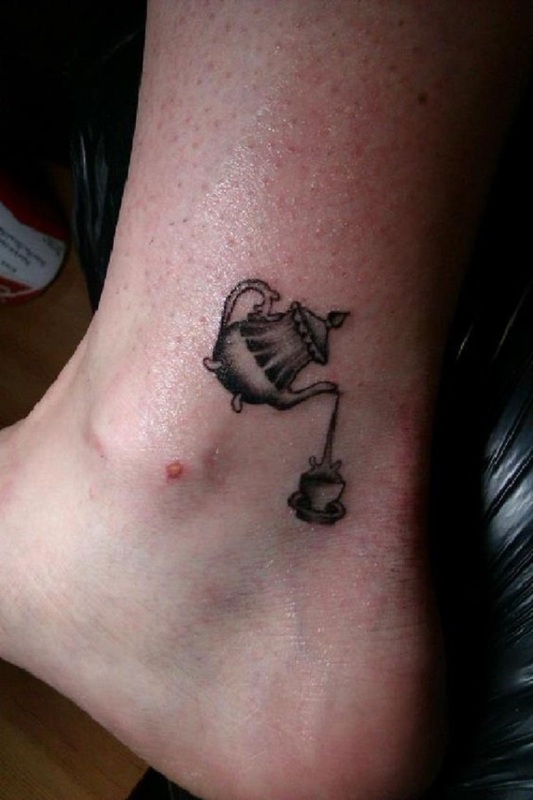 Here, I have a teapot tattoo design with hot tea in it. Traditional Teapot Set Tattoo Design. If you are looking to get your grand parents a tribute with teapot, then this traditional set of teapot would never be a bad idea. Vertical Teapot Tattoo Design. Get your inner arm covered with this all set vertical teapot tattoo design. 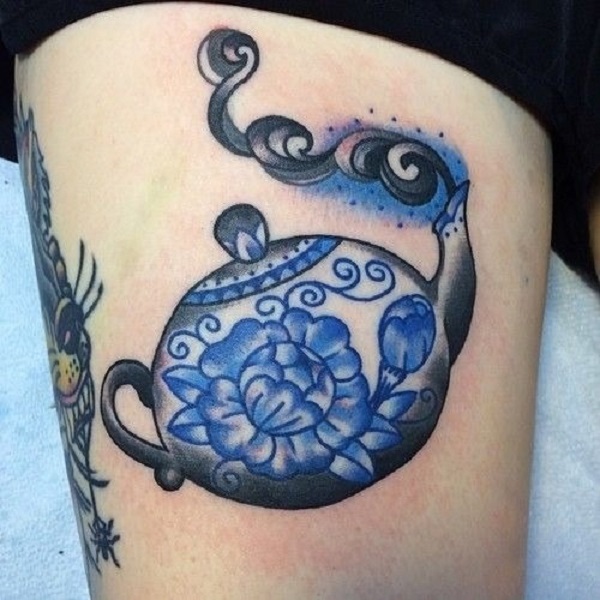 Blue Teapot Tattoo for Thigh. If you are an enthusiast of blue color and also of tea, then this blue floral teapot tattoo design won’t make any bad. A cute little shaded Teapot.Looking for something simple, cute, attractive and full of tea? Here is what you can get on your wrist. 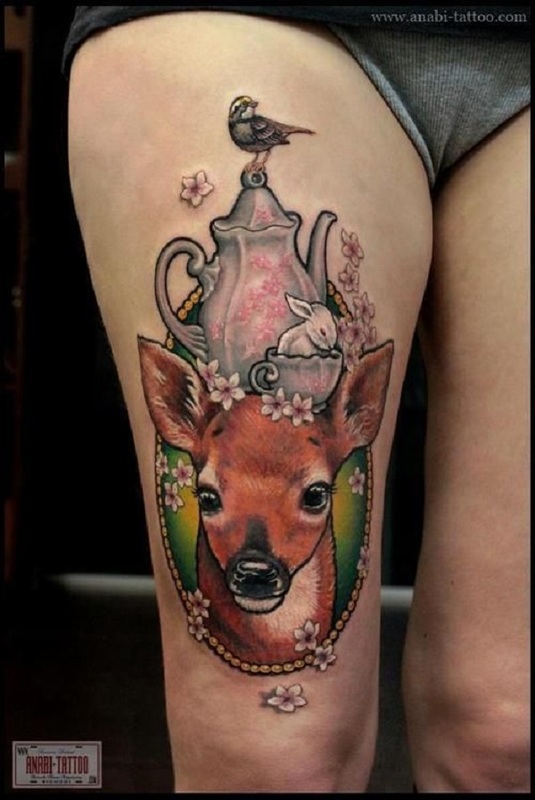 A Unique Teapot Tattoo with Rabbit and Deer. Usually, tea is not associated with animals like rabbit or deer, but you can have this unique teapot tattoo design that incorporates a rabbit and a deer, with great details. This Ankle Piece. You can embellish your ankle with cute little tea time piece having teapot, pouring tea in a cup. The Royal Teapot Back Piece. As mentioned earlier, Teapots are often considered to be a royal luxury. If you are impressed with it, have this royal teapot back piece. A Simple Teapot with a Cup of Tea. Pour tea of love in the cup with this simple, yet attractive teapot. Shaded Teapot on Inner Arm. Get a detailed tattoo of teapot on your inner arm, if you are a true lover of tea. 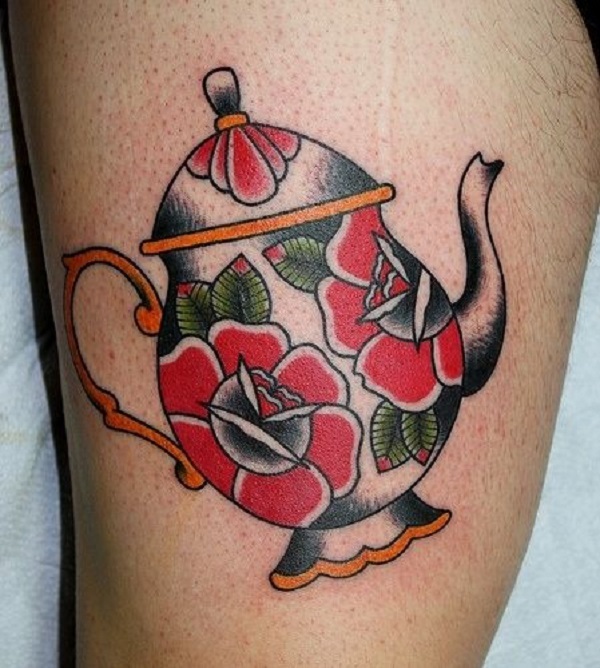 Teapot Tattoo on Thigh. 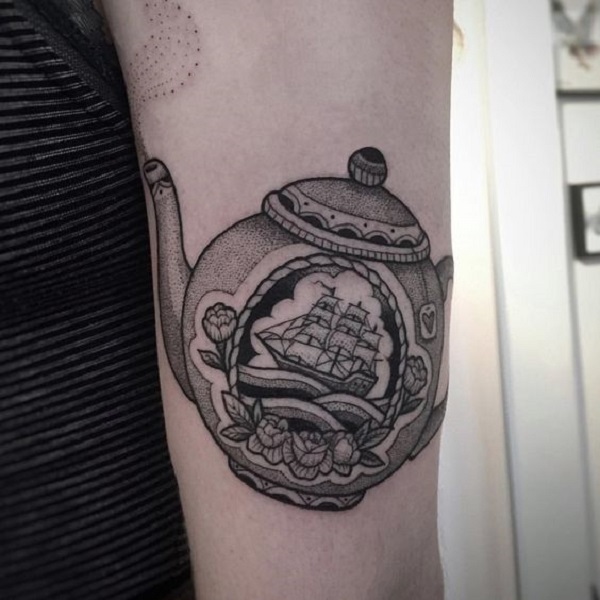 Another detailed teapot tattoo is next on my list of the great teapot tattoo designs and you won’t ignore this one, if you are a true admirer of tea. 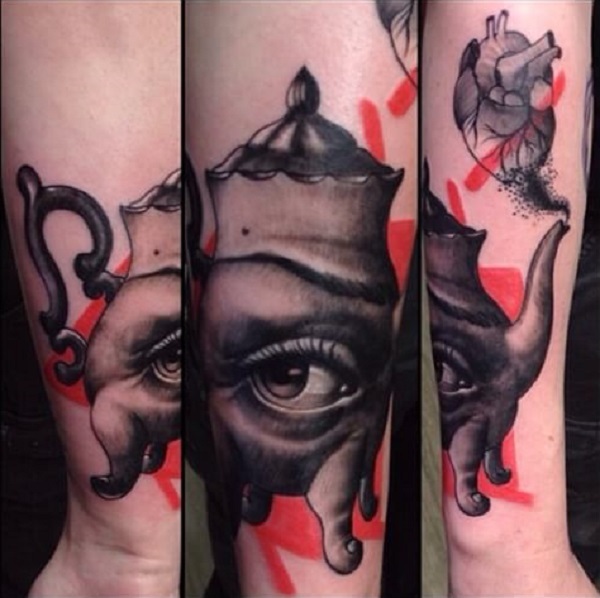 Eyed- Teapot Tattoo. 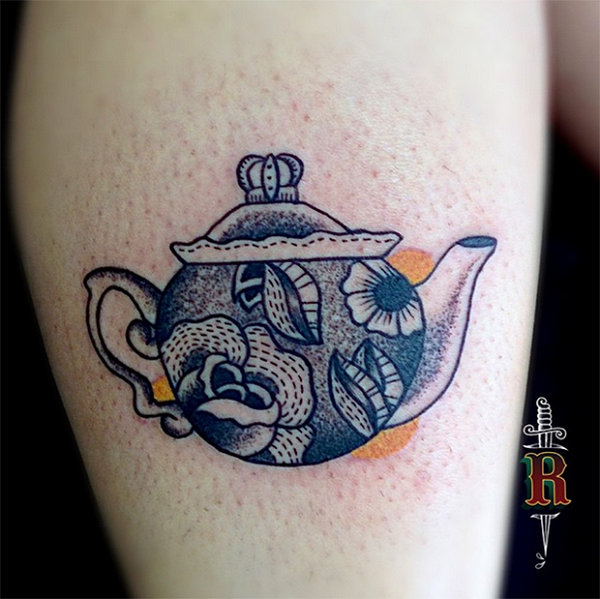 You might not find this teapot tattoo cheerful, but surely, you would give this tattoo another look, because of its amazing details and shadows. Red Teapot Tattoo with Roses. All the love things come in red color. Want example? The red roses on this red shaded teapot won’t make you find another example. 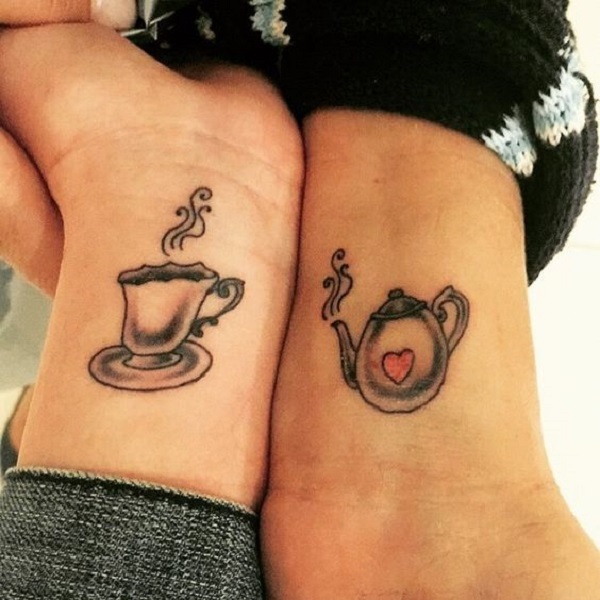 Teapot Tattoo Design for Couple. “You are my cup of tea, I am your teapot”. Be the explanation of this quote by having an amazing teapot tattoo design for two. Teapot in the Mirror. Teapots and mirrors are two different things, but the only thing that is similar in these two is that they both reflect the personality of a person. Traditional Tea Piece. 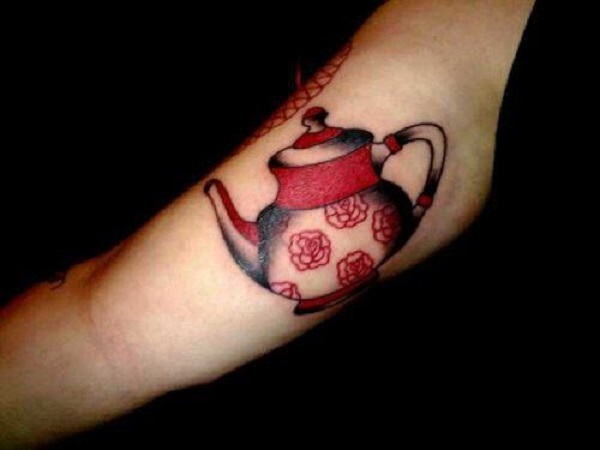 This cheerful traditional teapot tattoo design won’t make you look further. Outlined Teapot with Cup and a Teabag. When tea is made with teabag, it gives more flavor to this delicious drink. Same is the case with this tattoo. Make your tattoo flavorful with the teabag dipped in the teapot. Realistic Teapot Design. This gorgeous teapot design is an inspiration. “We’re All Stories In the End” Tattoo Design. “We’re All Stories In the End”, “Just Make its a Good One” is another amazing teapot tattoo design with this powerful banner of quote. Antique Teapot Piece. 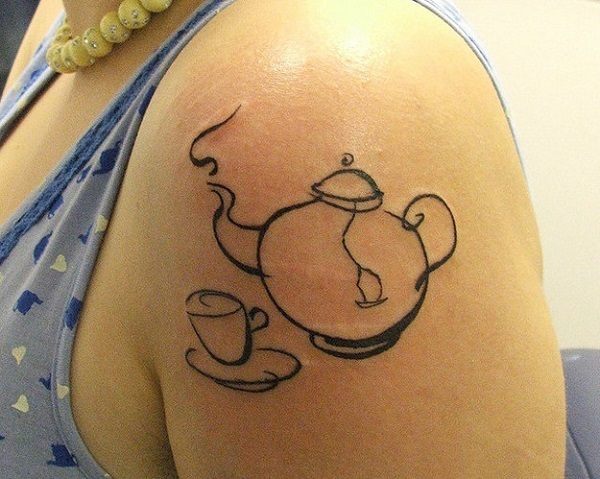 Another amazing looking teapot tattoo design is waiting for your look. Realistic Neo-Tad Teapot Set Tattoo Design. Looking for something? Check this Neo-Tad style teapot tattoo design. Teapot Mirroring Green Fields. Green meadows and a cup of tea….. Ahh the combo! Blue Teapot with Heart Tattoo Design. Traditionally, teapots comes in blue color, however, the addition of a heart and flowers in this blue teapot adds to the aesthetic value of this tattoo. 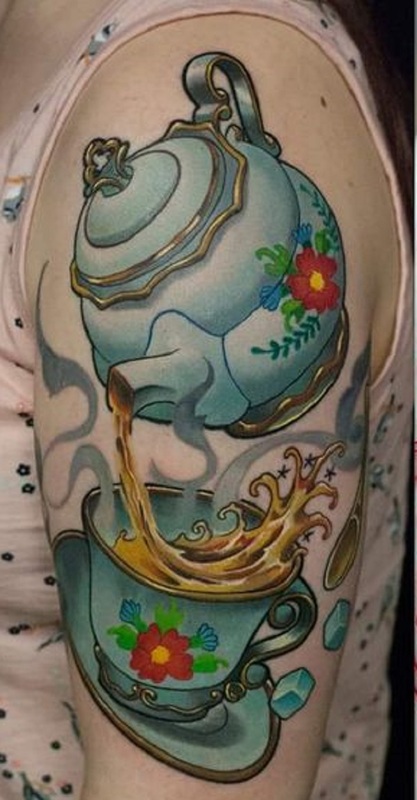 Another Realistic Teapot Tattoo Design with a Cup of Tea. You might not believe that the next one in the image is a tattoo. 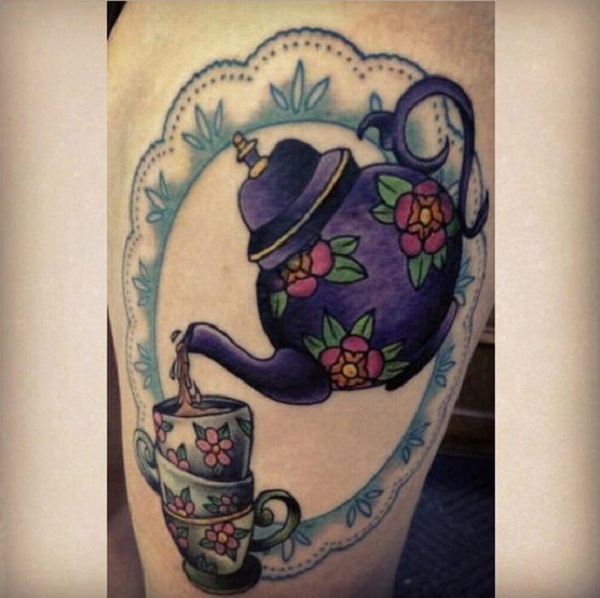 The fine details and amazing colors gives this teapot tattoo a really realistic look. Cute Mice Adding Sugar. The cute addition of mice in this tattoo design is worth considering. Detailed Teapot Ankle Piece. 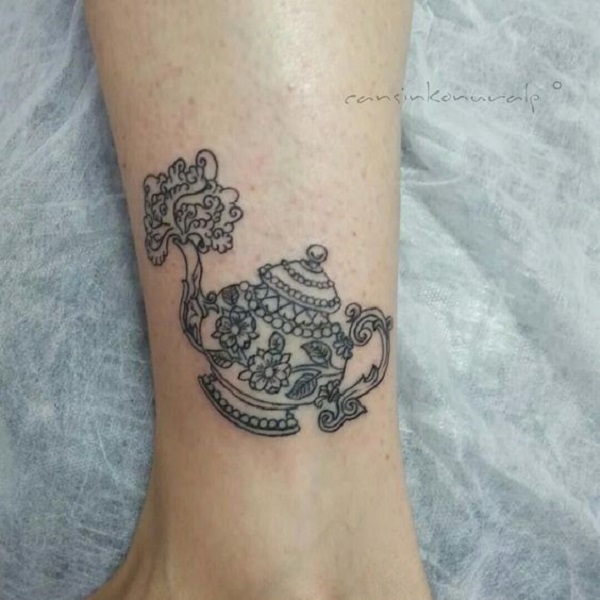 Get your ankle embellished with this unique and cool teapot design. 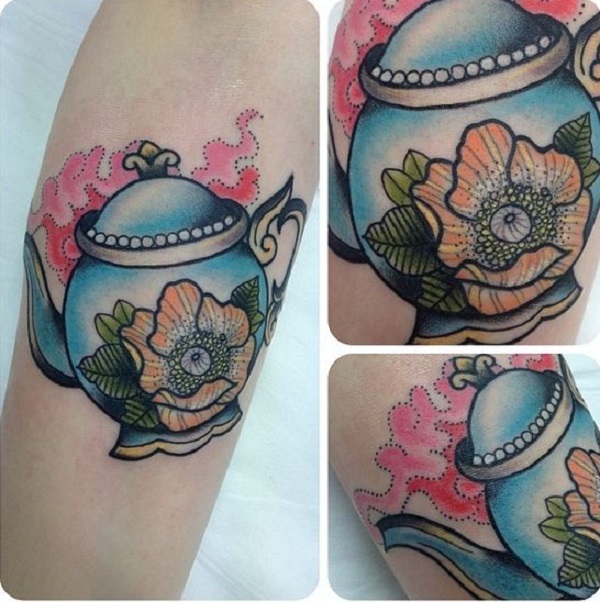 Lovely Colors Teapot Tattoo. Lots of lovely details here, that you surely don’t want to miss. “Where there is Tea, there is love”. Make yourself a true representative of love by having an amazing teapot design on your body.